eat, drink & be vegan: November Salba Contest! Here we go again, a chance to win the Source Salba giveaway for November! 1. How much omega-3 do the Source Salba REAL Whole Food bars (flavours original, apple/cinnamon, blueberry, peach, raspberry) contain? 2. Name a town in New Brunswick which carries Source Salba products. The winner will be notified on this blog at the beginning of December and we will then arrange to have the prize mailed to you. Please link through for the full contest rules. Go look for the answers! Back real soon with a foodie post! !. 0.7 g of omega-3 in the Source Salba REAL Whole Food bar. 2. The Corn Crib Natural Foods in Moncton, NB, carries Source Salba products. Thanks for the chance to win Salba products, Dreena! 1. they have .7 grams of omega-3. 2. a town that carries source salba products is St. John. this stuff looks so delicious. i hope i win!!! Isn't Salba a genetically modified grain? If there is such a fuss over other GMO foods such as corn and tomatoes, why isn't there an equal outcry over Salba? What makes this product exempt from the worries over other DNA-modified plants? Quinoa is also an "ancient grain" that hasn't been tinkered with by a large corporation. But how come Monsanto is vilified and Salba Corporation gets a pass? I love your site and your books and don't want to derail your giveaway, but I am puzzled by this unquestioned acceptance of a GMO food. Umm, okay--a little more research and I was able to answer my own question. Salba is NOT a genetically modified food--it is a white variety of chia seed which is the result of selective breeding. Results of a randomized controlled trial"
"Salba is a new generation of whole grain produced by Salba Corporation, Buenos Aires, Argentina, and cultivated by selective breeding (AgriSalba, Ica, Peru). Salba is a white-color variety from the original herbaceous plant Salvia hispanica L., which is >90% black grain and is known as a "running food" and used as both food and remedy by the ancient Aztecs." I do sincerely apologize for raising the question without more thorough research. But I like to know the origins of my food, and thought this info might help others who are quite new to Salba and wonder what it really is. question 2 - Woodstock NB. 2) My hometown - FREDERICTON!! 0.7 g and Woodstock are my answers. I am a big Salba fan, I hope I win! You have very nice blog to read and also please visit our website for getting more news about shipping through our shipping directory and also you can use our Indian free classifieds to get more business inquiry. Salba is sooooo good. 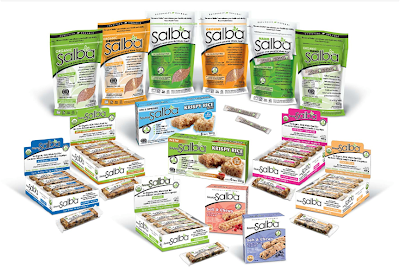 I just tried some of the Salba Smart products and they are amazing. If on the other hand, you need a detailed manual, the instructions are there for you to access. you are not our mother. She has a soft, pleasant voice, but your voice is rough, you are the wolf. who has started the last 12 games in the absence of Yi Jianlian. "I know I've improved a ton defensively this season." I can offer the cheap nike shox and puma shoes.their superior quality and attractive prices. the Burberry Polo Shirts are in the sale now. They are really good quality burberry polo shirts. please don't miss . With all the talk about “moral hazard” lately, I have realized something: there is a basic flaw in the way the subject is typically discussed with respect to financial corporations. I’m not saying that the people discussing it are necessarily misunderstanding, but the terms in which it’s typically discussed will tend to lead the unwary into sloppy thinking or confusion. The stockholders would lose what they put into the corporation but no more – exactly the same as when there is deposit insurance. The moral hazard problem exists in general with stockholders, whether or not the assets are insured, because of the limited liability inherent in the corporate form of ownership. There is no “FDIC put” for stockholders; there is merely the “corporate put” that exists for all corporations. because of the limited liability inherent in the corporate form of ownership. There is no “FDIC put” for stockholders; there is merely the “corporate put” that exists for all corporations. because depositors – with limited information and resources – aren’t able to do a very good job of policing and selecting banks. Their attempts to identify “bad banks” often result in “false positives” that precipitate bank runs. It makes much more sense to have regulators – who have more resources and better information – do the policing. (apparently not, as of yesterday) offered to investment banks and the like, the issue is not whether the stockholders are being protected – they’re always protected by the rules of corporate ownership – but whether the creditors are being protected. Are creditors being encouraged to make rash decisions about where to lend their money? Is the process of avoiding those rash decisions (as in the case of commercial banks) an inefficient one that could be done better by someone else (regulators, presumably)? Your blog is very good, it's the best blog I've ever seen, thank you!